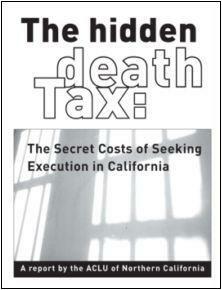 The following list is a sample of recent state studies focusing on issues of the death penalty. 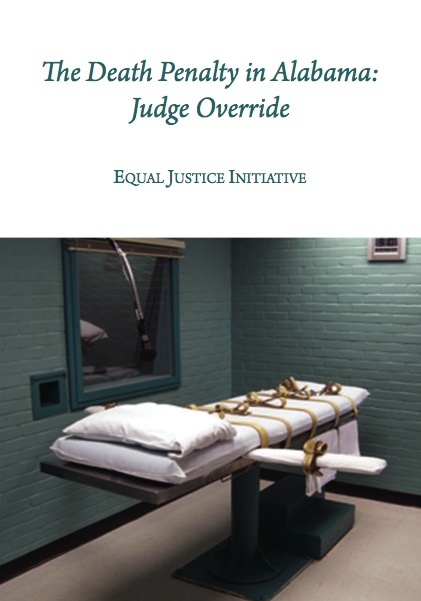 Study by the Equal Justice Initiative in Alabama exposing the practice of state judges imposing death sentences by overriding a jury's recommendation for life. Study by the American Bar Association's Death Penalty Moratorium Implementation Project found that Alabama's death penalty failed to meet fundamental ABA standards of fairness and accuracy. Study by the American Civil Liberties Union (ACLU), showing how structural and procedural flaws in Alabama’s criminal justice system stack the deck against fair trials and appropriate sentencing for those facing the death penalty. A study by University of Iowa law professor David Baldus of the death penalty in Arkansas showing racial patterns in sentencing. Study by the American Bar Association's (ABA) Death Penalty Moratorium Implementation Project determining that Arizona's capital punishment laws are plagued with serious problems. DPIC summary of "A roadmap to mend or end the California legislature's multi-billion dollar death penalty debacle" from Loyola of Los Angeles Law Review by Judge Arthur L. Alarcon & Paula M. Mitchell. 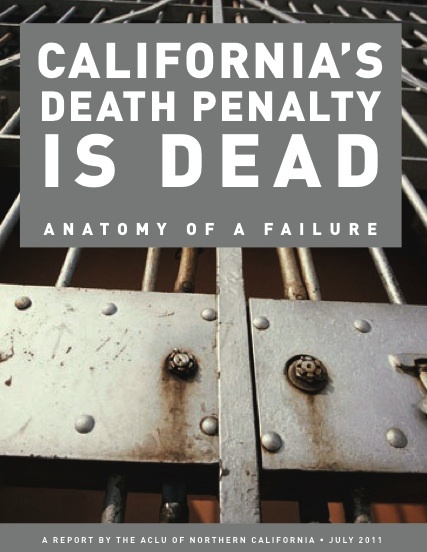 Study by the ACLU of Northern California catalogs numerous intractable problems and waning public support which may lead to the end of capital punishment in the state. 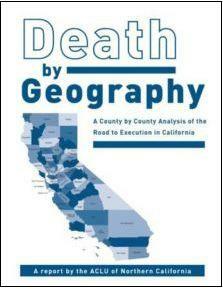 A study by the ACLU of Northern California revealing that only three counties (Los Angeles, Orange, and Riverside) accounted for 83% of the state's death sentences in 2009. A study by the ACLU of Northern California on the costs of the death penalty found additional expenses due to a net increase in the size of death row. A study by the ACLU of Northern California examining the variation among California counties in seeking the death penalty. A study by G. Pierce & M. Radelet published in the Santa Clara Law Review finding that the race of the victim in the underlying murder greatly affected whether a defendant would be sentenced to death. Study by Professor John Donohue of Yale University's School of Law of death sentences in Connecticut finding that seeking the death penalty often correlated with the race of the victim and the defendant, and not necessarily with the severity of the crimes. A five-year study of the operation of Delaware’s death penalty by Cornell law school. An evaluation of Florida's death penalty by Christopher Slobogin, Professor of Law and Psychiatry at Vanderbilt University. 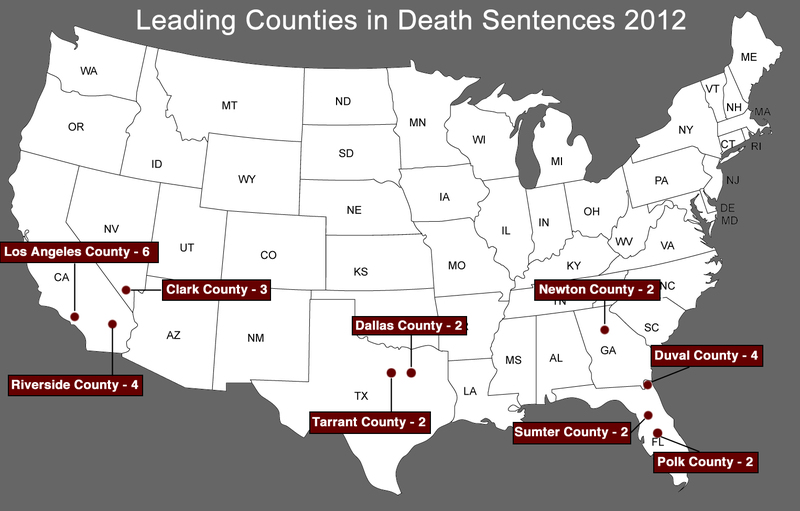 Study by the American Bar Association of Florida's death penalty system. Study by the Atlanta Journal-Constitution of Georgia's use of the death penalty finding that "getting the death penalty in Georgia is as predictable as a lightning strike." Study by the Georgia Innocence Project revealing that 83% of Georgia police agencies have no written rules on handling eyewitness identifications. Study by the American Bar Association Death Penalty Moratorium Implementation Project found that Georgia's death penalty fails to meet 43 ABA standards for improving the fairness and accuracy of the death penalty. Study by the Georgia Public Defender Standards Council analyzing death penalty cases in the state from 1973 - 2003. Sixth and final report of the committee created by the state legislature in 2003 and headed by Thomas P. Sullivan, a former U.S. Attorney. Study by the Commission, aiming to address problems Illinois Governor George Ryan identified two years prior, including potential safeguards to prevent the possible conviction and execution of innocent inmates. A state analysis of the costs of the death penalty in Indiana finding the average cost to a county for a trial and direct appeal in a capital case to be over ten times more than a life-without-parole case. Study by the American Bar Association calling for a halt to executions in the state because of concerns about the arbitrariness of the state's death penalty. Study by the committee examining the state's application of capital punishment and the hefty price tag of seeking the death penalty. Study by the Kansas government detailing the disparity in cost between death penalty cases and non-death penalty cases in Kansas. ABA study analyzing various laws, rules, procedures, standards, and guidelines relating to the administration of capital punishment in Kentucky. A recent study published by the Jesuit Social Research Institute of Loyola University pointed to numerous problems with Louisiana’s death penalty. A study conducted by Professors Glenn Pierce and Michael Radelet published in the Lousiana Law Review showing that the odds of a death sentence in parts of Louisiana were 2.6 times higher for those charged with killing a white victim than for those charged with killing a black victim. Study by the legislative commission established to examine the death penalty in Maryland recommending abolition of the punishment. Study by the Urban Institute detailing the disparity in cost between death penalty cases and non-death penalty cases in Maryland. Study by the American Bar Association's (ABA) Death Penalty Moratorium Implementation Project determining that Missouri's capital punishment laws are plagued with serious problems. Study by Prof. David Sloss of the St. Louis University School of Law showing that the chance of a death sentence appears to rest on what part of the state the crime was committed in. A study by Katherine Barnes of Arizona University Law School, and David Sloss and Stephen Thaman of St. Louis Univeristy Law School, studying 1046 cases of intentional homicide in Missouri to determine geographical and racial effects in the rates at which prosecutors seek the death penalty. A study by Dr. Terance Miethe of the Department of Criminal Justice at the University of Nevada on the costs of the death penalty in Nevada. A study by a New Hampshire commission evaluating the use of the death penalty within the state. A study by attorney Marcia Wilson revealing information on how the death penalty was applied in New Mexico after its reinstatement. A study by appellate lawyers Daniel R. Pollitt and Brittany P. Warren found that, despite pervasive evidence that North Carolina prosecutors disproportionately employed peremptory strikes to exclude black jurors, the state's courts have persistently refused to enforce the constitutional prohibition against race-based jury strikes. In 114 cases in which Batson issues were decided on the merits, North Carolina appeals courts never found any substantive Batson violation where a prosecutor had articulated a reason for the peremptory challenge of a minority juror. In the 74 cases in which it had decided Batson claims on the merits, the Supreme Court of North Carolina had never once found a substantive Batson violation. A comprehensive review of studies on the death penalty by Matthew Robinson, Professor of Government and Justice Studies at Appalachian State University. A study by Professor Frank Baumgartner showed that most of those originally condemned to death in North Carolina eventually received lesser sentences when their cases were concluded. A study by Professors Michael Radelet and Glenn Pierce found that the odds of a defendant receiving a death sentence in North Carolina were three times higher if the person was convicted of killing a white person than if he had killed a black person. A study published by a Duke University economist revealing that North Carolina could save $11 million annually if it dropped the death penalty. A study by the Independent Weekly showing that North Carolina conservatively spent at least $36 million dollars by seeking the death penalty instead of life in prison without parole over a seven year span. Study by the Charlotte School of Law revealing that obstacles entrenched within the criminal justice system impede efforts to identify those with severe mental illness and treat them fairly. Study by the Common Sense Foundation of North Carolina finding that at least 37 people on death row had trial lawyers who would not have met minimum standards of qualification at the time of the study. A study by Professor Jack Boger and presented by The Common Sense Foundation North Carolina Council of Churches. Study by the American Bar Association stating that Ohio's capital punishment system is so flawed that it should be suspended while the state conducts a thorough review of its fairness and accuracy. Study by the Associated Press of 1,936 indictments reported to the Ohio Supreme Court by Ohio counties with capital cases from October 1981 through 2002 finding that capital punishment has been applied in an uneven and often arbitrary fashion. 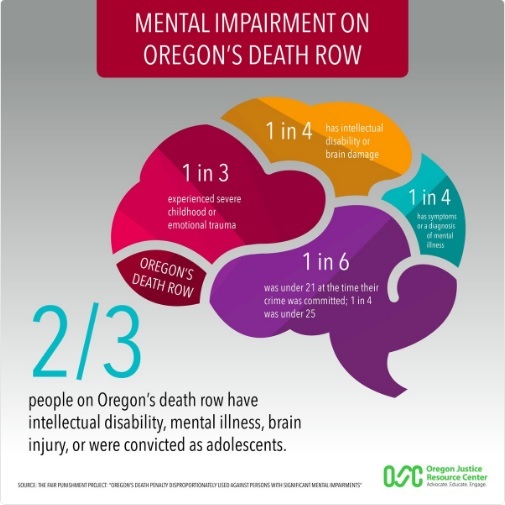 Analysis of case records, media reports, and opinions of Oregon legal experts by Harvard University's Fair Punishment Project ofinding that two-thirds of the 35 people on Oregon's death row have serious mental illness or intellectual impairment, experienced severe childhood trauma, or were under age 21 at the time of the offense. Study by Lewis & Clark Law School Prof. Aliza B. Kaplan, Seattle University criminal justice Prof. Peter Collins, and Lewis & Clark law candidate Venetia L. Mayhew examined the costs of hundreds of aggravated murder and murder cases in Oregon finding that the average trial and incarceration costs of an Oregon murder case that results in a death penalty are almost double those of a murder case that results in a sentence of life imprisonment or a term of years, and that, excluding state prison costs, cases that result in death sentences may be three to four times more expensive. Study by the Philadelphia Inquirer of death penalty appeals in Pennsylvania spanning three decades, finding a pattern of ineffective assistance by defense attorneys. A study by the Pennsylvania Advisory Committee on Wrongful Convictions identifying the most common causes of wrongful convictions and any current laws and procedures implicated in each type of causation. Study by the Associated Press showing the state goes through the expensive and time-consuming process of trying many death penalty cases and fighting appeals, but almost all cases end with a life sentence. Study by the American Bar Association (ABA) showing that flaws in Pennsylvania's death penalty system are so pervasive that the state risks executing an innocent person. Study by the Committee, making a series of 23 recommendations to the Pennsylvania Supreme Court, to the Legislature, to the state's Attorney General and District Attorneys, and to Governor Ed Rendell. Study by Professor Ann M. Eisenberg of the University of South Carolina of jury selection in 35 South Carolina homicide cases between 1997 and 2012 that resulted in death sentences, reviewing the strikes or acceptance of more than 3,000 venire members for gender and more than 1,000 veniremenbers for race. The study found that prosecutors exercised their peremptory strikes at nearly triple the rate against African-American prospective jurors than against white prospective jurors and that the death-qualification process further impeded a substantial number of African-American jurors from serving, contributing to an overrepresentation of whites on death penalty juries. The gender study showed that, while men and women were excused for cause at comparable rates, both were struck more for views against the death the death penalty than for pro-death penalty views and women were 3.8 times more likely to be excluded for opposing the death penalty than for pro-death penalty views. Women were 1.4 times more likely to be struck for cause for opposing the death penalty than men and men were 2.3 times more likely to be struck than women for being unable to consider a life sentence. Prosecutors were 1.4 times more likely to peremptorily strike a woman than a man, and defense lawyers were 1.4 times more likely to peremptorily strike a man than a woman. Study of homicide cases in South Carolina by Professor Isaac Unah of the University of North Carolina-Chapel Hill and attorney Michael Songer finding that prosecutors were more likely to seek the death penalty when the victim in the underlying murder was white, if the victim was female, and when the crime occurred in a rural area of the state. An examination of every first-degree murder case in Tennessee from 1977-2017 found that the facts of the crime did not predict whether a death sentence would be imposed. Rather, the best indicators were arbitrary factors such as where the murder occurred, the race of the defendant, the quality of the defense, and the views of the prosecutors and judges assigned to the case. Study by the ABA detailing racial and geographic disparities in capital cases, poorly trained defense attorneys, heavy caseloads for those representing defedants, and inadequate procedures to address innocence claims. Study by the ABA focusing on the fairness and accuracy of the death penalty system in Texas. 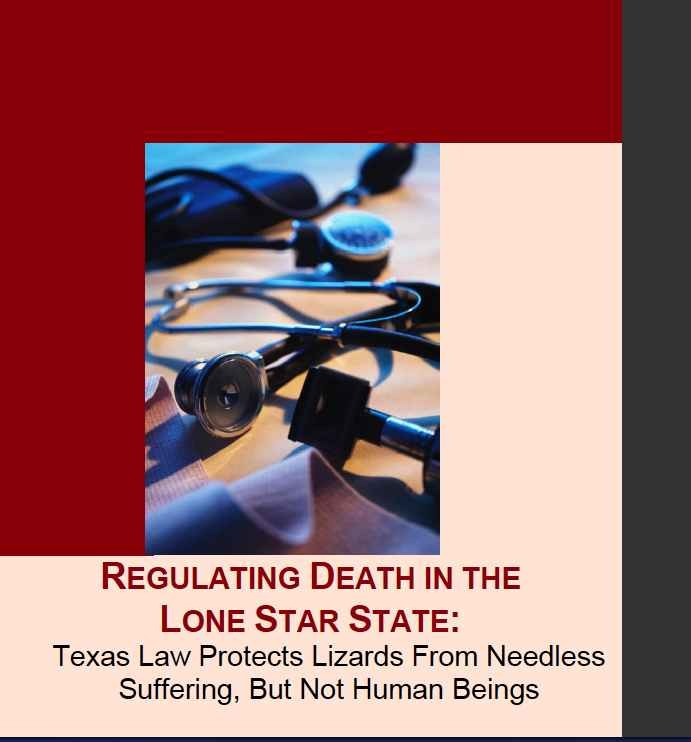 A study by the ACLU of Texas and Northwestern University's Center for International Human Rights revealing that procedures for euthanizing animals in the state are more carefully regulated than the protocol for executing death row inmates. A study by The Justice Project analyzing the cases of 39 innocent Texans who collectively spent more than 500 years in prison for crimes they did not commit. A study by Amnesty International examining many of the nearly 200 executions that have occurred during Governor Rick Perry’s term in office. 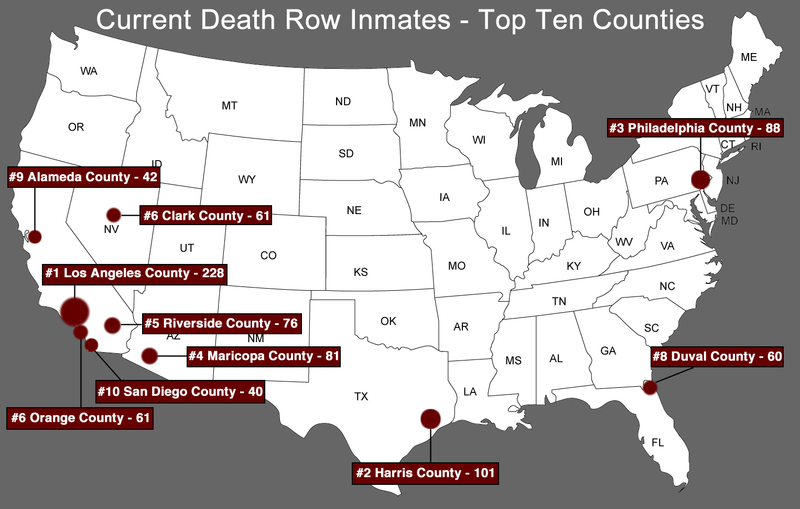 A study that reveals disparities in who receives the death penalty in Texas by Scott Phillips, a professor at the Department of Sociology and Criminology at the University of Denver. A study by Scott Phillips, a sociology and criminology professor at the University of Denver, published in the Law & Society Review focusing on the imposition of death sentences in relation to the victim's social status. A study by Prof. Scott Phillips of the University of Denver exploring the relationship of race to death sentencing in Harris County (Houston), Texas. A study by Professor Scott Phillips of the Univeristy of Denver found that black defendants in Houston, Texas, are more likely to be sentenced to death than white defendants, even when other variables are accounted for. 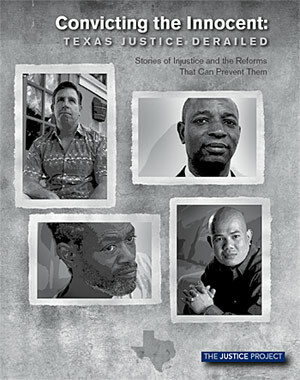 A study by the Justice Project concerning criminal justice procedures in Texas. Study conducted by the National Alliance on Mental Illness (NAMI) has revealing that Texas is almost last among states in spending on mental health services and performs poorly in other mental health areas, while executing many inmates with serious mental illness. Study by the Texas Defender Service calling for substantial changes in the way Texas handles capital murder cases. A study by the Texas Defender Service. Study by the ABA focusing on the fairness and accuracy of Virginia's death penalty system. Study by the Innocence Commission for Virginia of 11 wrongful conviction cases in Virginia finding that mistaken eyewitness identification is the major reason innocent people have been convicted in the state. Study by the American Society of Crime Laboratory Directors finding that the Virginia lab's internal review process was flawed and that labs had botched DNA tests. Study by the Death Penalty Subcommittee of the Committee on Public Defense of the Washington State Bar on the state's death penalty. A new section of DPIC's website demonstrates that capital punishment is actually carried out in only a small percentage of U.S. jurisdictions. 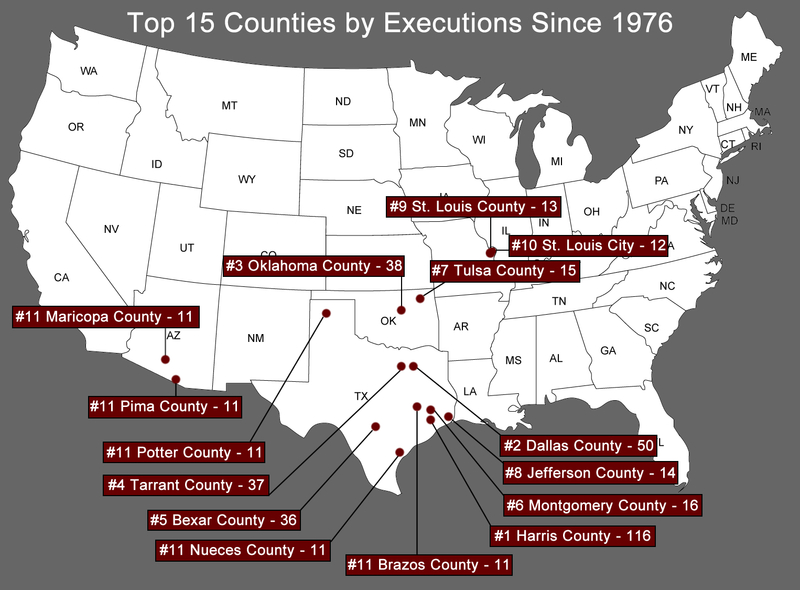 For example, one map shows that less than 1% of counties in death penalty states accounted for 30% of the executions in the U.S. since 1976. Similarly, less than 1% of the counties were responsible for 27% of current death row inmates and 35% of recent death sentences.